In this one-and-half-day class, you will learn the basic skills needed to create a mosaic stepping stone: designing the piece, choosing colors, cutting the ceramic tiles, adhering the tiles to the concrete form with mortar, then applying grout to finish the piece. 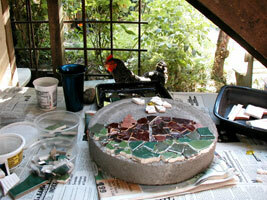 I will provide all materials (great selection of tile, pottery and glass! ), equipment, instruction, cheerleading, and coffee. You should just bring a bag lunch on Saturday (fridge available). Also, if you have a broken dish youve been dying to do something with, or tile/glass/stone in a color or pattern you love, by all means bring that to incorporate. You will be creating your mosaic atop a preformed concrete paver, 12 across in your choice of three shapes: round, square or hexagonal. You should be able to complete one stepping stone during the workshop: permanent, weatherproof art for your garden - or your mom. We will be working in the space behind/under the house - not actually in the backyard, but still in the open air, with a nice view of the garden and a roof over our heads. So be sure to wear (old, crummy) clothing in layers, as usual in San Francisco. The workshops are small, only two to five students, so youll get lots of individual attention. The cost of the workshop is $110 ($50 deposit, the rest when you arrive) per person. To reserve your space, please send your deposit check to the address above, specifying which date you prefer. Im quite flexible as to scheduling, so you are not necessarily limited to a weekend, or even to two consecutive days (The process does require more than one day). Also, if you have a friend or two wanting to learn mosaic, you can schedule your own workshop without waiting for me to gather students and set a date. Please call me at 648-6740 if you have any questions. I hope that this project will open you up to the potential of mosaic to enrich your world and that of those around you. Maybe youll want to tile everything in sight if only you had the time! A stepping stone indeed.